One railwayman died and another suffered "horrific" burns when fire broke out on a maintenance train in the Channel Tunnel Rail Link. More than 50 firefighters were called to the scene almost a mile inside a tunnel under the River Thames between Swanscombe, Kent, and Thurrock, Essex. 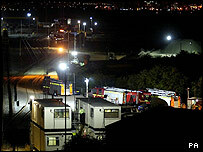 The fire was on a train carrying cables used in the construction of a new line linking Gravesend to London St Pancras. An investigation into the cause of Tuesday's fire is under way. Fire investigators entered the tunnel at 0400 BST on Wednesday to check it was safe for police and rail accident teams to go inside. Kent Police said on Wednesday that there was "nothing at present to suggest the cause was suspicious". About 20 fire appliances attended the incident along with water and foam units after the alarm was raised at about 1915 BST on Tuesday. The construction workers' train had been travelling from Essex to Kent and was quickly evacuated, according to Kent Police. However, a spokeswoman for Kent Fire and Rescue Service confirmed a man was found dead by four firefighters wearing breathing masks who were searching the train with thermal imaging equipment. A spokesman for the Health and Safety Executive confirmed the man who died was a railway shunter and the critically injured man was the train driver. He suffered 90% burns to his body and was taken to Darent Valley Hospital, Dartford, before being transferred to the burns unit at Broomfield Hospital, Chelmsford. Murray McGregor, of Essex Ambulance Service, said Kent paramedics and firefighters brought him out on the Essex side of the tunnel with "absolutely horrific burns". He said: "He was immediately placed on one of our ambulances and taken across the Dartford Crossing. "Crews had requested a burns trauma team at Darent Valley Hospital be ready and waiting for this man. His injuries are absolutely critical." Paul Barratt, from Kent Ambulance, said it had been a complicated operation. "It was difficult at first because of smoke in the tunnel which obviously hampered things to an extent. "The problem was that the tunnel is nearly two miles long and comes out in two different counties, and communications are difficult underground." A Channel Tunnel Rail Link spokeswoman said: "The fire started in a maintenance locomotive in the Thames Tunnel which is part of the construction of section two of the rail link. "I have not been told there was any sort of collision. Another train went in to get the locomotive out, but I think the fire only involved one train." The fire was confined to the part of the tunnel still being built. The stretch of track, once it is completed, is not due to be used by Eurostar until 2007. The company said it did not expect any current services to be disrupted.